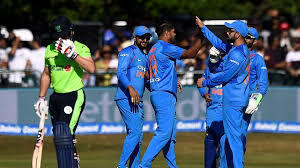 India defeated Ireland by 143 runs in the second and final Twenty20 International at Dublin last night. With the win, the visitors have clinched the series 2-Nil. Put into bat, India posted a massive 213 for four in stipulated 20 overs courtesy half-centuries by KL Rahul and Suresh Raina. Rahul smashed 70 off 36 balls whereas Raina scored 69 off 45 balls. Hardik Pandya remained unbeaten at 32. In reply, Ireland was bundled out for mere 70 runs in 12.3 overs. Kuldeep Yadav and Yuzvendra Chahal bagged three wickets each while Umesh Yadav took two wickets. Team India will now proceed to the United Kingdom to play three T-20s, three ODIs and three Tests with England. The first T-20 match will be played on Tuesday in Manchester.